Keri Mikulski is holding a WHY I LIKE/DISLIKE AUGUST book give-away contest. And WOW! is holding a flash fiction contest. You have the neatest pictures! I loved the one from yesterday! Tanks, darling... i love my digital camera! 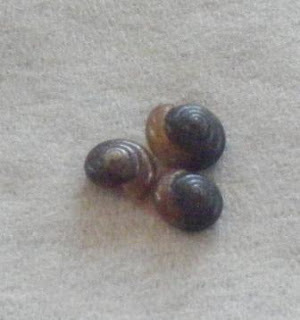 This one is of snail shells found in our flower garden. They were really tiny. I laid them on a napkin and took the shot. Yesterday's was actually taken by one of my daughters, obviously of sunlight streaming through one of our windows. Is it bad that I saved yesterday's to my computer because I thought it was so awesome? Ahhh. I am so flattered! Another contest. How wonderful. I'll check it out. Thanks for posting my contest! ;) Nice pic! TJ, they're real snail shells. My daughter found them in one of our flower gardens. They were actually very tiny. No problem Keri! Thanks for holding a contest for us to win great books!